Sarcoptic mange, also called scabies, in dogs is caused by the Sarcoptes scabiei mite, a highly contagious skin parasite. The mites burrow into the skin and cause severe itching, which can result in the formation of scabs and hair loss. It is a nonseasonal parasite that can be found in dogs of all ages and breeds. How will sarcoptic mange/scabies affect my dog? Scabies causes severe itching, so dogs that experience prolonged scratching and hair loss are suspect. Symptoms are most often seen on the ear flaps, elbows, hocks, abdomen, and chest of infested dogs. Scabies is difficult to diagnose so clinical signs and elimination of other risk factors are important as skin scrapings are often unreliable. It is important to consult with your veterinarian if you suspect an infestation. Your veterinarian can recommend effective therapies for this disease. How do I prevent my dog from getting scabies? Maintaining the good health of your dog is important to preventing scabies. Dogs that roam with other dogs, reside at a shelter or boarding facility, or have frequent contact with other dogs are susceptible as scabies is easily transferred between dogs. Can humans be harmed by scabies? Scabies is zoonotic (can be passed from animals to humans), so pet owners that have close contact with their dogs may develop an itchy rash. After the dog has been treated, however, symptoms usually disappear. For veterinary professionals, more detailed information on sarcoptic mites can be found at https://www.capcvet.org/guidelines/sarcoptic-mite/. If your dog has severe itching, causing scabs and hair loss, it may have scabies. 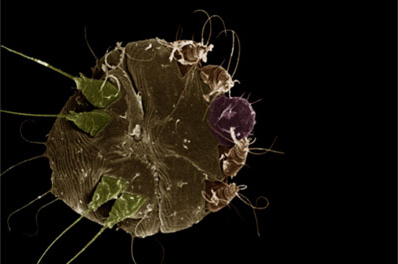 Scabies is caused by a tiny mite that burrows into the skin. Keeping your dog healthy and avoiding frequent contact with dogs who might have scabies are the best way of keeping your dog safe. Scabies can be passed to people, but usually clears up by itself when their pet is treated. While the symptoms of scabies look very similar to those of allergic dermatitis (skin allergy), the treatments are quite different. 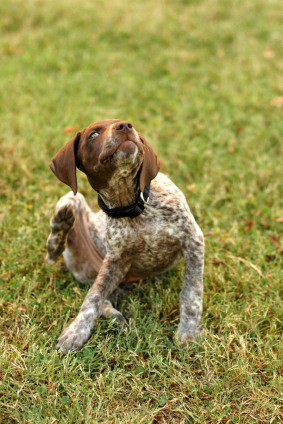 Your veterinarian can help determine what is making your dog itchy and provide safe and effective treatment.